When we were small children, one of our favorite activities was to record "radio shows" on our double-decked cassette player. One of us would be the host, the other would be a guest. We quickly developed some favorite characters that we would interview regularly. Our best and most loved was Rita Book, an author who would come onto the radio show and, with the help of the radio host, would tell stories to the "listeners." Each of us would tell a couple lines of the story, then pass it on to the other to continue. Little did we know, this fun little game would blossom into a shared desire to create a story that would bring happiness and life lessons to our children. We hope through this venture that our talents will grow and as we are nurtured by your positive influences, and others like you, we will blossom into great authors. With the arrival of Spring last week, we have been observing the many changes around us in our world. In the Southwest region, the farthest west point of Texas where Ashley lives, Spring brings sporadic temperatures, a few blades of grass coming up through the dirt, and lots of wind! On Jessica's side of the country, Spring brings rain, green leaves on the trees, and lots of flowers. Some flowers, like roses and tulips, were created to just be pretty. 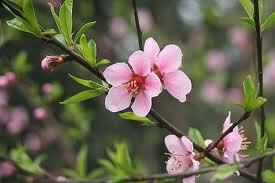 But some flowers, like those on fruit trees, become something better, something sweeter. They were meant for something more. (We're all about cheesy metaphors, so prepare yourself). Our writing can be like the flowers. Some stories were meant to just be pretty, a nice story to be enjoyed in the moment. Other stories were created to become more, to provide something sweet and desirable beyond their simple beauty. Some stories change people's lives, or at least can change a person's perspective, open their eyes to something new. There is nothing wrong with being a simple flower, bringing joy and happiness in their bright colors and sweet fragrances. They were created for that very purpose. We hope to be able to write a fruit blossom kind of story. The kind of story that is not only enjoyable to read, but once the last word is read and the blossom falls from the tree, it makes way for something else. We hope that once the cover closes that the spirit of that book will linger and hopefully give life to some undiscovered hopes or dreams. We challenge everyone to make a similar goal, to create something that will uplift others and last beyond those final words. Hooray for cheesy metaphors! I'm a huge fan of cheesy metaphors, and I like this one. It's not even particularly cheesy. :-) I have had to think a lot about what it takes to make a story more of a fruit blossom story and less of an annual bloom. I'd love for you two to explore this topic more in future posts because I think it's something we all strive for in our writing. We want our work to be fun and entertaining, but with the knowledge we have of our divine nature and our awareness that our talents are a gift from God, I feel we should be putting more into our books than just entertainment.